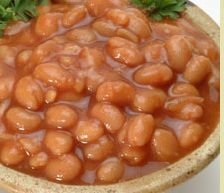 These mouth watering Southern Baked Beans will compliment any BBQ or Grilling menu. Top with the bacon pieces. Bake, covered, for 45 to 60 minutes. 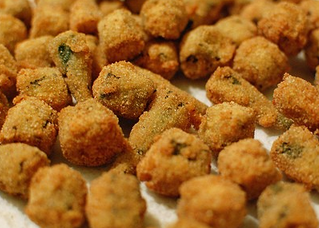 This "Fried Okra" recipe taste delicious and the okra is tender. It is better than what you would get at Cracker Barrel! Heat oil in a large, heavy-bottomed skillet or Dutch oven to 350 degrees F.
In a medium bowl, combine cornmeal, flour, salt, pepper, garlic, onion, and cayenne pepper. Dip okra in buttermilk and then dredge in cornmeal-flour mixture to coat well. Carefully add okra to the hot oil and cook until golden brown. Remove from oil, drain on paper towels, and then serve immediately. "Creamed Corn Cornbread" is an old great Southern cornbread recipe that is delicious and easy to make. Whisk together to combine well. In a large bowl, combine the buttermilk, eggs, and creamed corn, whisking together until combined. Slowly pour into the dry ingredients and mix for 3 minutes. Bake at 425 degrees F. 5 minutes. Lower to 350 degrees and bake until golden brown or unit a toothpick comes out clean.